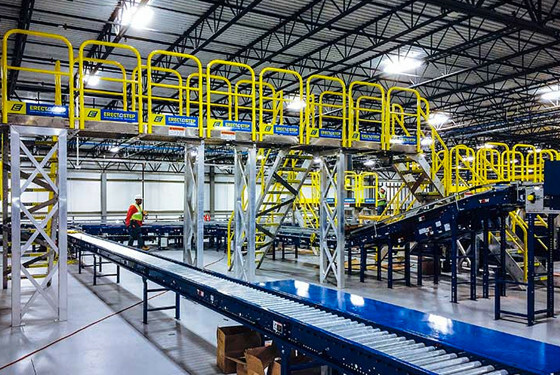 Erectastep modular work platforms and aluminum stairs are pre-engineered for unlimited configurations. 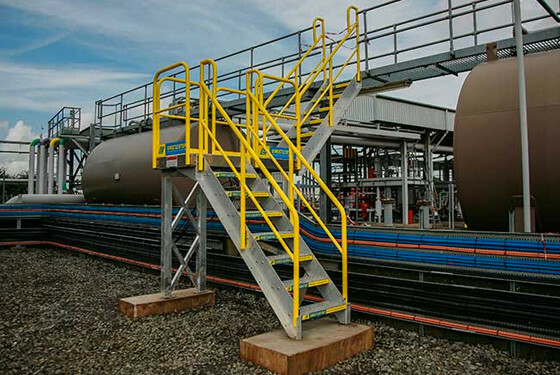 With this system, we can create durable, cost-effective safety crossovers, equipment access platforms, and raised walkways, which allow for a safe and easy passage over pipes, walls and other obstructions. 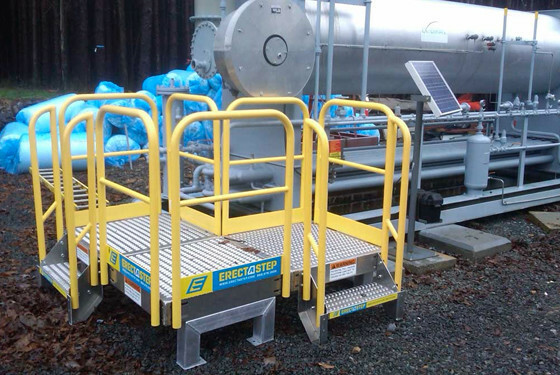 ErectaStep’s modular design provides an endless variety of configuration possibilities, beginning with a single 3′ x 3′ platform to unlimited platform area requirements. Designs can easily be expanded with the aid of tower supports. Platforms require intermediate support when three or more are joined. Each ladder also functions as a support tower. 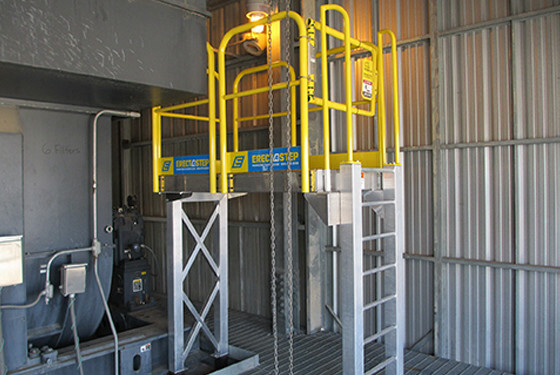 Configurations can be altered and components can be re-purposed at any time.Ladder components are available in eleven sizes. The available components are Handrail, Ladder, Platform, Stair, and Support. Available styles are 1-11 Step Stair Unit, 1-11 Step Tower Support, 1-11 Step Ladder, 2-11 Step Tower Support, Standard Handrail, and 36″ X 36″ Platform. Dimensions vary per model. Platforms and stairs are stamped for the highest strength and accuracy available. All components are robot and laser cut and welded. 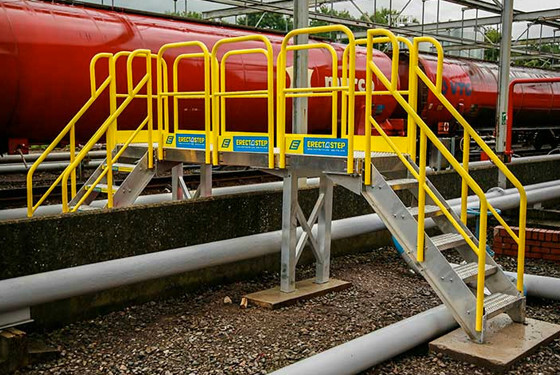 ANSI yellow powder coating on handrails meet OSHA safety requirements and provide a durable finish. Erectastep Aluminum Modular Platforms and Stairs are made with robot and laser cut aluminum for long lasting durability and strength. Same bolt hole pattern in components provide easy assembly and a variety of configurations. 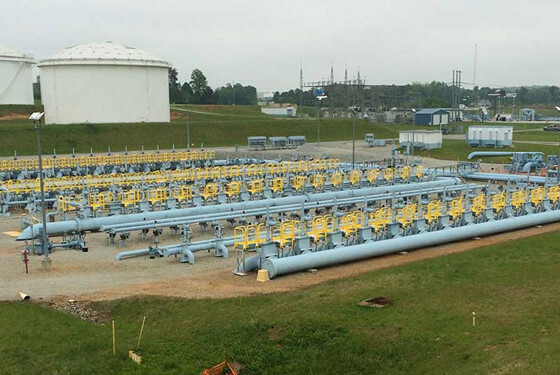 No welding or fabrication is required to construct any configuration.